It is recommended that you visit the dentist at least every six months for a dental examination. Regular dental visits may not be something that everyone looks forward to, but it is one of the most important appointments that you have to keep if you are concerned about your health. Perhaps you have wondered why you need to have your teeth checked and cleaned every six months. Or maybe you are considering whether you must keep an appointment because you don’t like going to dental clinics or because something more important has come up. Be aware that if you avoid dental examinations, you might end up paying in the long run in terms of poor dental health. Your oral health is also a direct reflection of your overall health. So if your teeth and gums are not healthy, it will also have an impact on your general physical will being. Here are a few important reasons why you must have a regular dental examination. You may be diligently brushing and flossing your teeth every day, but there are still some areas in the mouth that you will completely miss during the brushing and flossing. If plaque builds up, then it becomes extremely difficult to remove and it will get solidified. Solidified plaque is call tartar and will need professional help to remove. What is the big deal in having tartar on your teeth, you may be wondering. Plaque and tartar carry bacteria that can significantly damage the tooth enamel and lead to cavities. Tartar forms below and above the gum line and infect the gums. Its rough and porous nature can cause gum diseases and receding gums. During a dental examination, your dental hygienist will clean the tartar and plaque before it causes damage. Gingivitis or inflammation of gums is often caused due to poor dental hygiene. Regular dental examinations and cleaning can help prevent not only gingivitis, but also more serious gum diseases such as periodontitis. Gum diseases can be quite painful and cause puffy and swollen gums which may bleed when you brush your teeth or even eat something. If you leave it untreated, gum diseases can even lead to loss of teeth. 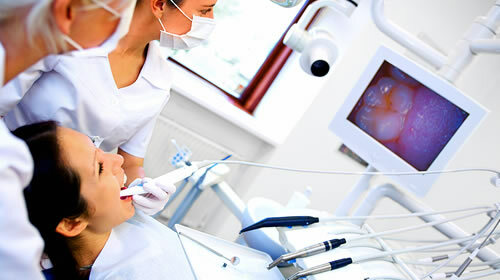 A dental checkup typically includes screening for oral cancer. The earlier you catch the disease the better the chances of survival. Most oral cancer cases are not discovered until they are too late because not many people pay attention to their mouth. A dental examination is one of the most effective ways in which you can detect whether there are any signs of oral cancer. Sometimes, everything looks normal outside, but you may have an impacted tooth or some other problem in the jawbone that may be cause for concern. A significant part of visiting your dentist for a dental examination is getting an x-ray of your jaw bone and teeth when required. An x-ray will allow your dentist to see exactly what is happening beneath the gums and they will be able to diagnose issues that are not visible outside. Damage to the jawbone, cysts, tumours, swelling etc. are some of the problems that an x-ray can reveal. Destructive diseases may show very little symptoms, but progress very quickly. To prevent that, make sure that you get regular check ups and x-rays whenever needed. Dental examination is not just about checking your gums, mouth, please, and tongue. Your dentist will also check your head, neck, and lymph nodes located just below your jawline for any lumps or swelling. If there are any abnormalities, it could possibly indicate a serious health issue. If you have a swollen lymph node, get it checked by a medical professional because it could be an indication of certain types of diseases or even cancer that may require immediate attention. There are many bad habits such as biting your nails, smoking, chewing ice, eating sticky or hard food items, grinding your teeth, or drinking coffee and red wine etc. that may be significantly impacting your oral health. If you are not made aware of the damage that is being caused by these bad habits, you will continue to indulge in them. During a dental examination, a dentist may point out the damages that are caused by these destructive habits, does allowing you to make suitable alterations to your lifestyle to prevent further damage. Every year, millions of dollars of dental insurance remained unused. While the specific terms of your policy may vary, most insurance plans with pay for a dental check-up and cleaning every 6 months. You may have a dental insurance plan and if you are not using it, not only are you just throwing money away right now, but you are also not taking any mitigating steps to prevent future spend on treating dental problems that you have been prevented. Yes, there are many excuses for you to skip a dental appointment. You may not have enough time and your schedule may be very hectic. Not just that, no one likes to visit a hospital or a dental clinic. None of these excuses warrant missing and dental appointment when you consider the amazing benefits that regular cleaning and check-up can have. Schedule an appointment with your dentist so you can keep your smile healthy and bright for as long as possible.